If you live in a city . . .
your water comes to you in pipes from a municipal water supplier who gets water from lakes and rivers and sometimes wells, treats it a bit to make it clear, odor-free, germ-free, non-corrosive, and generally palatable, then pumps it through a maze of pipes to your home. As part of its treatment, the city water plant adds chlorine or a mixture of chlorine and ammonia called chloramine to the water to kill pathogens. The treatment plant also adds other chemicals to clarify the water and prevent corrosion in pipes. Some cities also add an industrial waste product called fluoride which is believed to prevent tooth decay. Between the city water plant and the home lie miles of pipe, some of it very old, made of a variety of materials and in varying states of repair. The water is affected a lot by pipe materials and by contaminants that can enter the water if the pipe leaks or is broken. The water that leaves the treatment plant is not the same water that enters the home. A lot of things happen to it along the way. Most city water plants do a praiseworthy job of taking some pretty dirty raw water from a lake or river, getting the mud and sticks out of it and turning it into water that looks clear, tastes good, and won’t cause a cholera epidemic. They supply water that is of really high quality for hosing down driveways and flushing toilets. People who have watched a plumber cut open a pipe entering their home, however, usually don’t feel good about drinking their tap water anymore, or even bathing in it. This very decent water delivered by the city can be made excellent in the home, which is, after all, where the fine polishing of water should take place. Home treatment makes much more sense than trying to supply top quality drinking water for flushing toilets and mopping floors. 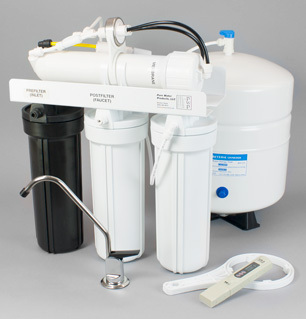 Point of entry treatment for city water most often consists of cartridge or tank-style activated carbon filters to remove disinfectants (chlorine or chloramine). If the water is “hard” (meaning that it has lots of calcium and magnesium in it), it can be treated with a conventional water softener or one of the several newer “salt-free” alternatives. Treatment for hardness is mainly done to protect pipes and fixtures and to make water more aesthetically pleasing. Adding a point-of-entry ultraviolet (UV) unit to assure bacteria-free, cyst-free water for the whole home is becoming more popular, especially in light of the increasing number of “boil water” alerts. If you live outside the city . . .
your water usually comes to you from a well on your own property. A well is essentially a hole in the ground with a pipe through which water in an underground pool is sucked up to the surface. It’s like drinking from a glass with a drinking straw. Also, many non-city dwellers pull their water through pipes directly from a pond or stream and treat it themselves. If you have a well or draw water from a lake or river, you are your own water treatment superintendent, so you need to pay attention to what you’re about. The first thing you should do is get a good, comprehensive water test. This will cost you a couple of hundred dollars, but it will pay for itself easily in what you’ll save by not purchasing unnecessary or inappropriate equipment. If the test shows that your water is perfect, the peace of mind you gain will pay for the test. The reason the well test is needed is that you don’t have the benefit of the testing that’s done for you with city water. If there’s arsenic in the city’s water source, the city is obligated to take care of it and to tell you about it. If there’s arsenic in your well, the only way you’ll know is by having a good test done. With private water sources there is a much greater chance that extreme treatment will be needed. Here are some of the common issues with well, river and pond water, along with some of the ways they can be corrected. Bacteria — pathogens like E. coli can be controlled by chlorination or ultraviolet treatment. Iron and manganese— treated with iron filters that often require pre-treatment with aeration or chlorine. Small amounts of iron and manganese can also be treated with a water softener. Hydrogen Sulfide (rotten egg odor) — treated by chlorination or aeration followed by filtration. Pesticide, Herbicide, general chemical contamination –Carbon filtration. Tannins (tea colored water) Ion exchange and carbon filtration. Sand, Sediment — Backwashing or cartridge style sediment filters. Dissolved Solids (high mineral content) — Reverse osmosis. Whether your water comes from a city, a lake, or your own well, an undersink reverse osmosis unit is your most complete drinking water option.